Home NEWS Clergy call for peace amid election that has 'deeply divided' the nation. Clergy call for peace amid election that has 'deeply divided' the nation. Rev. 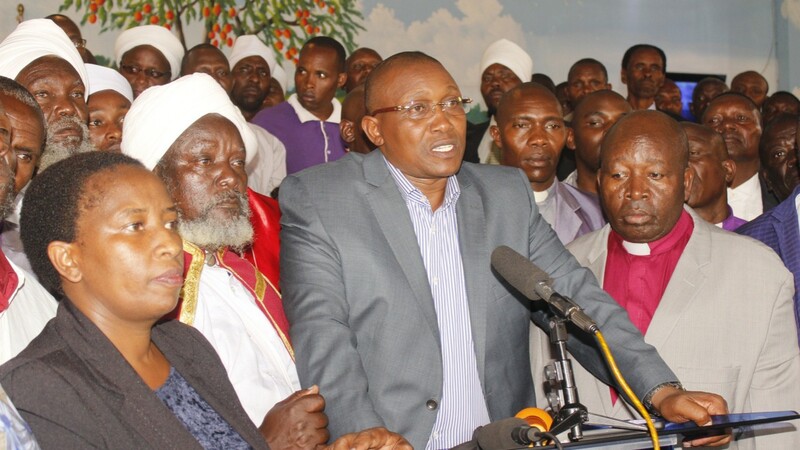 David Kariuki Ngari leads a battery of bishops and church leaders at Calvary Celebration Centre Thika on Monday where they called for peace and political tolerance as the country heads to the October 26 polls. A section of Pentecostal clergy is calling on churches to preserve its place as sanctuary for healing and uniting Kenyans as the nation grapples with a very divisive election full of hate. Led by Bishop Rev. David Kariuki Ngari alias Gakuyo of Calvary Celebration Centre Thika, the men of the cloth said that it was quite unfortunate that the church had been split between supporting either Jubilee or NASA. The religious leaders urged political leaders to desist from using threatening and abusive language, instead appealing for calm and dialogue among stakeholders in order to solve the current misunderstanding over the presidential rerun scheduled for October 26. “We are very concerned that our nation is so deeply divided due to the current rise in political temperatures and therefore would like to remind Kenyans that there is more that connects us than divides us. Sadly, some people want to create political unrest, an issue as the church, we will not accept,” said Rev. Gakuyo. He denounced today’s planned demonstrations by NASA leaders against the IEBC arguing that they will just aggravate the economic recession in the country. “Let us pray for our political leaders so that they are not tempted to cause chaos. The language being used by politicians in the public gallery is unchristian and can burn this country. We want peace. We urge politicians to understand that this is our country and desist from spitting hate and disintegration,” said the bishop. Rev. Gakuyo called on IEBC and other constitutional bodies to execute their mandate as prescribed in the constitution noting that the future of this country depended on them, especially now that there was great tension in the country. Otherwise, he called on the security agencies to ensure there was peace and tranquility across the country and that no one should be allowed to breach peace. A member of the Covenant of the Clergy Archbishop Joseph Ng’ang’a Ndua warned the church against taking sides in this political duel as this would disintegrate the country even further. He called on the clergy to instead take it upon themselves to reconcile the nation. “I want to call on all church leaders to restrain from taking sides in this whole political debate. It is quite unfortunate that some of us are being induced into following certain political factions due to either financial gains or tribal affiliations,” said Archbishop Ndua. He categorically stated that such misguidance by the men of God will not go unpunished. He further cursed anyone who might be using the ‘power of darkness’ to spill blood or sacrifice innocent people for political gains, warning them that the wrath of God awaits them. He called for political tolerance and peaceful coexistence among all Kenyans during and after the October 26 election.